Tony Corrente and his crew did an outstanding job on Sunday. One thing I expected, one thing I was a little surprised by during Denver’s 26-16 win over New England in the AFC Championship Sunday. I expected it to be a well officiated game — and it was. Tony Corrente and his crew did an outstanding job. There were not many fouls called — only nine total in the game and only six were accepted. But the difference? There were no false starts, no delay of games, no illegal motion, only one snap infraction and that was a defensive offsides. I talked to Seattle coach Pete Carroll before the NFC Championship between the Seahawks and 49ers and he asked me about the theory of letting teams play. We both agreed that was not the case, but in fact, it is the discipline that teams show by not creating false starts or other five-yard snap infractions. 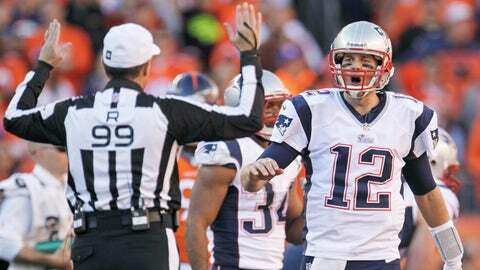 To me, that’s the difference in the playoffs and it was evident in the AFC Championship Game. What I didn’t expect was for Denver to handle New England as easily as it did. Eight major penalties were called and the crew kept control of the game right from the start. There were no unsportsmanlike conduct or personal fouls called. I hope to see the same in the NFC game.